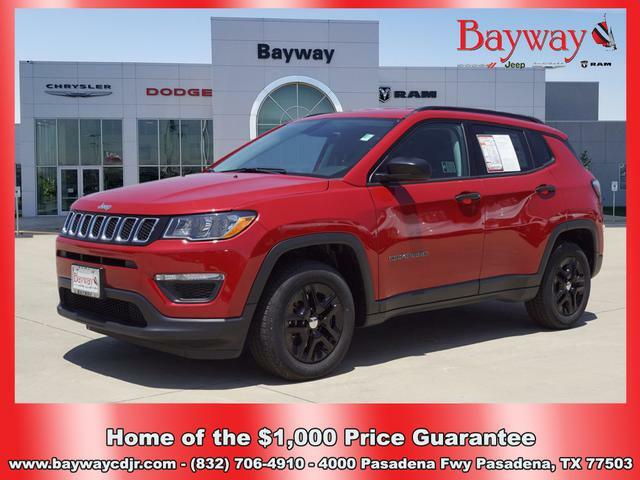 With features like push button start, backup camera, Bluetooth, braking assist, hill start assist, stability control, traction control, anti-lock brakes, dual airbags, and side air bag system, this 2018 Jeep Compass Sport is a must-have ride. This one's available at the low price of $24,285. This safe and reliable SUV has a crash test rating of 4 out of 5 stars! The exterior is a suave red. Do more than just drive: Bluetooth capability provides wireless access for all your electronic devices. Interested? Call today and take it for a spin! Auto fans love the push button start, backup camera, Bluetooth, braking assist, hill start assist, stability control, traction control, anti-lock brakes, dual airbags, and side air bag system of this 2018 Jeep Compass Sport. We're offering a great deal on this one at $24,485. This SUV scored a crash test safety rating of 4 out of 5 stars. The exterior is a timeless black. Simplify your everyday with Bluetooth technology that keeps you connected. Don't wait on this one. Schedule a test drive today! This 2018 Jeep Compass Sport includes a push button start, backup camera, Bluetooth, braking assist, hill start assist, stability control, traction control, anti-lock brakes, dual airbags, and side air bag system and is a car that deserves some serious attention. This one's a deal at $24,530. Want a SUV you can rely on? This one has a crash test rating of 4 out of 5 stars! The exterior is a ravishing red. With Bluetooth, you can access your electronics anywhere, anytime. Come see us today and see this one in person! This 2017 Jeep Renegade Latitude is a real winner with features like a push button start, backup camera, braking assist, hill start assist, stability control, traction control, anti-lock brakes, dual airbags, side air bag system, and digital display. We're offering a great deal on this one at $24,681. Looking to buy a safer SUV? Look no further! This one passed the crash test with 4 out of 5 stars. Complete with a beautiful black exterior and a black interior, this vehicle is in high demand. Come see us today and see this one in person! If you're looking for a smooth ride, look no further than this 2017 Jeep Renegade Altitude with a push button start, backup camera, braking assist, hill start assist, stability control, traction control, anti-lock brakes, dual airbags, side air bag system, and digital display. This one's a deal at $25,020. This one's a keeper. It has a crash test safety rating of 4 out of 5 stars. Rocking a sharp white exterior and a black interior, this car is a sight to see from the inside out. Good cars sell fast! Give us a call and schedule an appointment today! 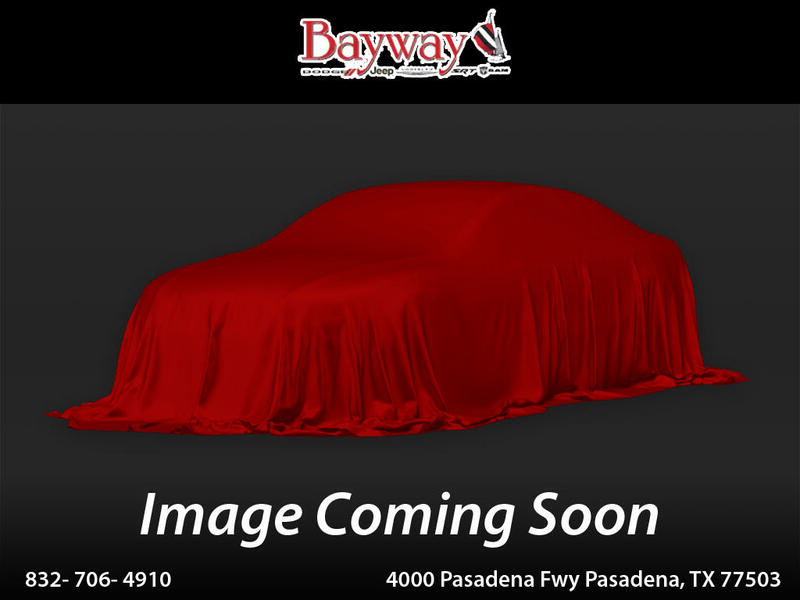 This 2017 Jeep Renegade Latitude boasts features like a push button start, backup camera, braking assist, hill start assist, stability control, traction control, anti-lock brakes, dual airbags, side air bag system, and digital display and will not disappoint. This one's available at the low price of $25,060. You can trust this SUV because it has a crash test rating of 4 out of 5 stars! Drivers love the charming green exterior with a black interior. Don't wait on this one. Schedule a test drive today! If you're looking for a smooth ride, look no further than this 2018 Jeep Renegade Latitude with a push button start, backup camera, Bluetooth, braking assist, dual climate control, hill start assist, stability control, traction control, anti-lock brakes, and dual airbags. This one's a deal at $25,170. Be sure of your safety with a crash test rating of 4 out of 5 stars. The exterior is a classic black. Bluetooth allows you to talk on your phone while keeping your eyes on the road. Call or visit to talk with one of our vehicle specialists today! When you're ready to upgrade your ride, opt for this 2018 Jeep Renegade Latitude, which includes features such as push button start, backup camera, Bluetooth, braking assist, dual climate control, hill start assist, stability control, traction control, anti-lock brakes, and dual airbags. This one's available at the low price of $25,170. Be sure of your safety with a crash test rating of 4 out of 5 stars. The exterior is a sharp black. Interested? Call today and schedule a test drive! 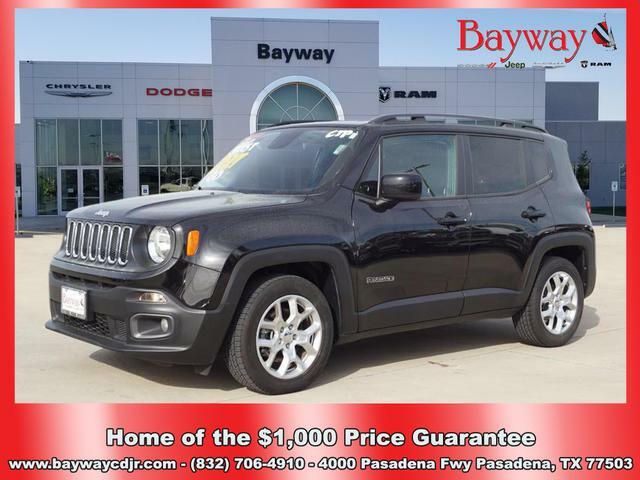 Auto fans love the push button start, backup camera, Bluetooth, braking assist, dual climate control, hill start assist, stability control, traction control, anti-lock brakes, and dual airbags of this 2018 Jeep Renegade Latitude. We've got it for $25,170. Looking to buy a safer SUV? Look no further! This one passed the crash test with 4 out of 5 stars. The exterior is a timeless red. Tired of pulling over to make a phone call? Enjoy a wireless connection on-the-go with Bluetooth technology. This is the vehicle you have been waiting for! Call now to schedule a test drive! People everywhere will love the way this 2018 Jeep Renegade Latitude drives with features like a push button start, backup camera, Bluetooth, braking assist, dual climate control, hill start assist, stability control, traction control, anti-lock brakes, and dual airbags. This one's a deal at $25,170. Want a SUV you can rely on? This one has a crash test rating of 4 out of 5 stars! The exterior is a charming white. Enjoy handsfree communication with your Bluetooth. Want to learn more? Call today for more information. You'll love the look and feel of this 2018 Jeep Compass Latitude, which features a push button start, backup camera, Bluetooth, braking assist, hill start assist, stability control, traction control, anti-lock brakes, dual airbags, and side air bag system. We've got it for $25,635. Be sure of your safety with a crash test rating of 4 out of 5 stars. The exterior is a timeless silver. Make your move before it's too late schedule a test drive today! 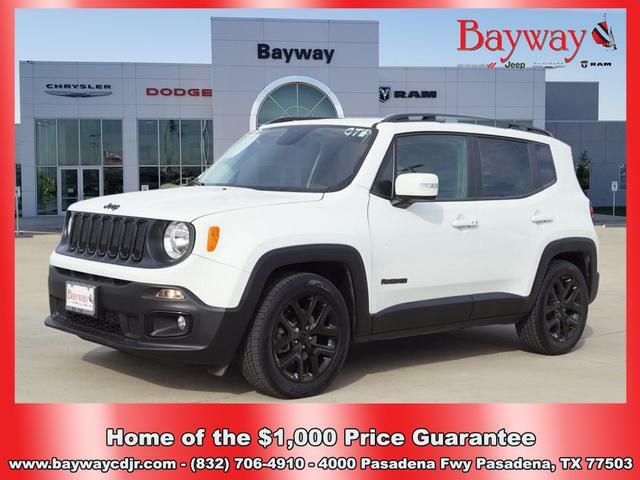 If you're shopping for a quality vehicle with perks such as a push button start, backup camera, braking assist, hill start assist, stability control, traction control, anti-lock brakes, dual airbags, side air bag system, and digital display, this 2017 Jeep Renegade Altitude may be the car for you. We're offering a great deal on this one at $26,205. Looking to buy a safer SUV? Look no further! This one passed the crash test with 4 out of 5 stars. Complete with a beautiful yellow exterior and a black interior, this vehicle is in high demand. Call today to schedule your test drive! 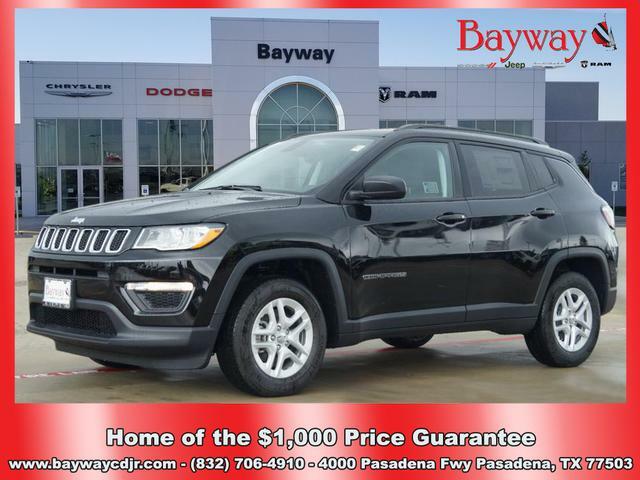 Featuring a backup camera, Bluetooth, braking assist, a power outlet, hill start assist, stability control, traction control, anti-lock brakes, dual airbags, and side air bag system, be sure to take a look at this 2019 Jeep Cherokee Latitude before it's gone. This one's a deal at $26,535. 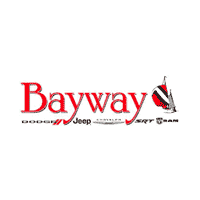 Looking to buy a safer SUV? Look no further! This one passed the crash test with 4 out of 5 stars. Rocking a classic gray exterior and a black interior, this car is a sight to see from the inside out. Call today to test it out! With top features including the push button start, backup camera, Bluetooth, braking assist, dual climate control, hill start assist, stability control, traction control, anti-lock brakes, and dual airbags, this 2018 Jeep Renegade Latitude is a great decision. We've got it for $26,665. Don't skimp on safety. Rest easy with a 4 out of 5 star crash test rating. The exterior is a beautiful black. Built-in Bluetooth makes it easier to stay connected on the road. Interested? Call today to take this vehicle for a spin! 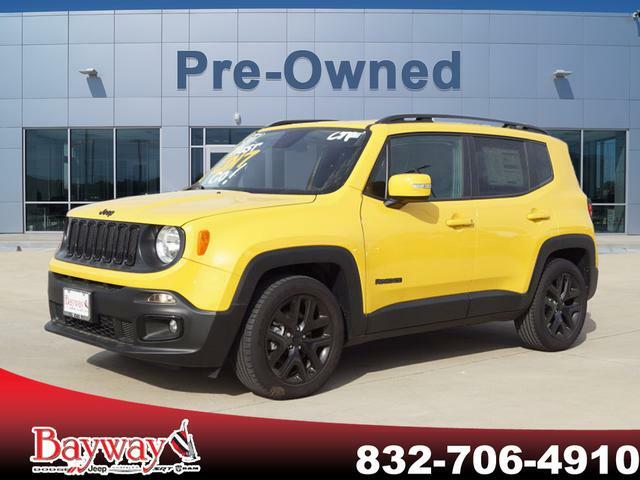 You'll love getting behind the wheel of this 2018 Jeep Renegade Latitude, which is complete with amenities such as a push button start, backup camera, Bluetooth, braking assist, dual climate control, hill start assist, stability control, traction control, anti-lock brakes, and dual airbags. This one's a deal at $26,665. Stay safe with this SUV's 4 out of 5 star crash test rating. The exterior is a gorgeous red. Your electronics will sync up easily with this Bluetooth enabled vehicle. Interested? Call today and take it for a spin! When you're ready for an automotive upgrade, try this 2019 Jeep Cherokee Latitude on for size, which features a backup camera, Bluetooth, braking assist, a power outlet, hill start assist, stability control, traction control, anti-lock brakes, dual airbags, and side air bag system. We've got it for $26,680. With an unbeatable 4-star crash test rating, this SUV puts safety first. Flaunting a charming dk. red exterior and a black interior. Call and schedule your test drive today! People everywhere will love the way this 2019 Jeep Cherokee Latitude drives with features like a backup camera, Bluetooth, braking assist, a power outlet, hill start assist, stability control, traction control, anti-lock brakes, dual airbags, and side air bag system. This one's a deal at $26,895. This SUV is one of the safest you could buy. It earned a crash test rating of 4 out of 5 stars. The exterior is a dazzling white. Want to learn more? Call today for more information. 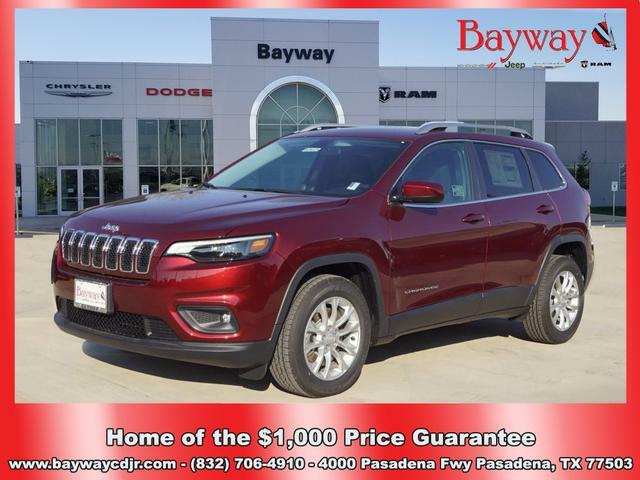 If you're shopping for a quality vehicle with perks such as a backup camera, Bluetooth, braking assist, a power outlet, hill start assist, stability control, traction control, anti-lock brakes, dual airbags, and side air bag system, this 2019 Jeep Cherokee Latitude may be the car for you. We've got it for $26,950. Want a SUV you can rely on? This one has a crash test rating of 4 out of 5 stars! It has a charming velvet red pearlcoat exterior and a black interior. Don't regret waiting on this one! Call today to schedule your test drive. With features like backup camera, Bluetooth, braking assist, a power outlet, hill start assist, stability control, traction control, anti-lock brakes, dual airbags, and side air bag system, this 2019 Jeep Cherokee Latitude is a must-have ride. This one's on the market for $26,950. With a crash test rating of 4 out of 5 stars, everyone can feel secure. A timeless billet silver metallic clearcoat exterior and a black interior are just what you need in your next ride. Don't wait until it is too late! Call today to schedule an appointment. This reliable 2018 Jeep Renegade Latitude comes with a variety of features, including push button start, backup camera, Bluetooth, braking assist, dual climate control, hill start assist, stability control, traction control, anti-lock brakes, and dual airbags. This one's available at the low price of $28,865. With a 4-star crash test rating, this is one of the safest vehicles you can buy. The exterior is a classic red. Enjoy handsfree communication with your Bluetooth. Call today to test it out!